In January we decided to take the leap to HDTV at the ranch. Since we already had DirecTV at our place, we decided to just upgrade our main DVR/receiver to HD. Although it was zero cost for us, they had to spend half a day installing a new dish on our roof (and they actually properly grounded everything per the NEC code, that is amazing!). We received a HR22 receiver, which was pretty sweet for a non-Tivo unit. I wrote about my experiences with the SD version of this box in my blog last year. The cool thing about that box, is that if you hook up an ethernet connection to the Internet, you can receive video on demand (VOD), from DirectTV. The selection is middle of the road, but they have a large cluster of SD and HD content. The really cool part is that they are starting to deliver pay per view HD movies as well as 1080P HD content over that link. The VOD interface is available from the channel guide or from stand alone section of the main menu. 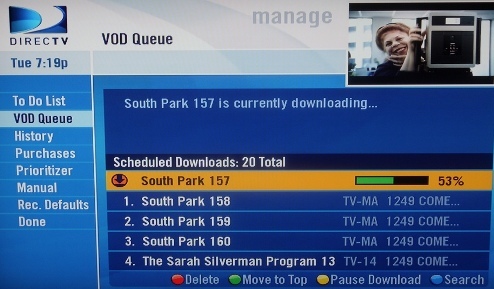 You can also select VOD content to be downloaded to your DVR from DirecTV's web page. While the interface isn't incredibly intuitive, it does work and after a while you get used to it. Last night I decided to try downloading two episodes of Ax Men in HD, after one of my co-workers mentioned how cool the show was. While you can watch shows while they are downloading, I decided to let them go full course before taking a look. I use MRTG to monitor my home network usage, so I decided to see how much bandwidth was used during the download period of time. I am very happy to say that DirecTV's servers were able to completely saturate my ADSL link. Normally when my link is somewhat idle it has about 10kbps of traffic from various server machines, and only spikes a bit during large downloads or when my wife is on her work VPN. As you can see in the MRTG graph below it took about 3 hours or so to download two HD episodes, each episode being 45 minutes, so with my network I'm at about 1/2 real time. I guess it is time to get a DS3 at home.